The wood carvers were back again in Chasseneuil-sur-Bonnieure this year. Either I missed them last year, or they had a year's break. 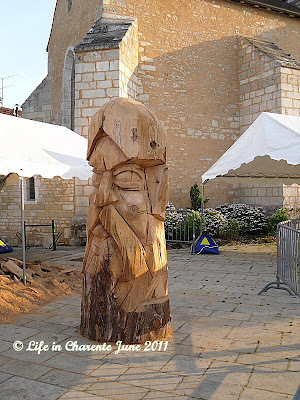 I have not seen any new carvings around the town, so I suspect that they took a year off. For photos from previous years, take a look under 'labels' and 'wood carving'. As I said in earlier blogs, the team of wood carvers come from Canada. They are amazing to watch and they work with chain saws, hammers and chisels and finally they sand everything smooth by hand. The end products are eventually treated with sealer and placed in and around the town for all to see. 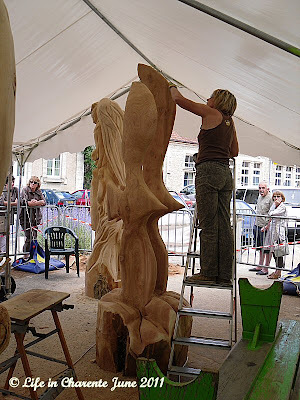 I made four visits down to the town this year, so I could take photos as work on the various sculptures progressed. Note all photos can be enlarged with a single click. There were in fact 5 logs in this group; two were out of shot over on the right. 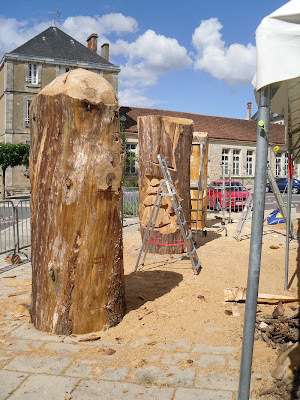 The wood is cedar and the smell while they are working is very strong. You can see they had just begun when I took this photo. This are the same three logs as above and you can see how much work had been done on them by the middle of the week. 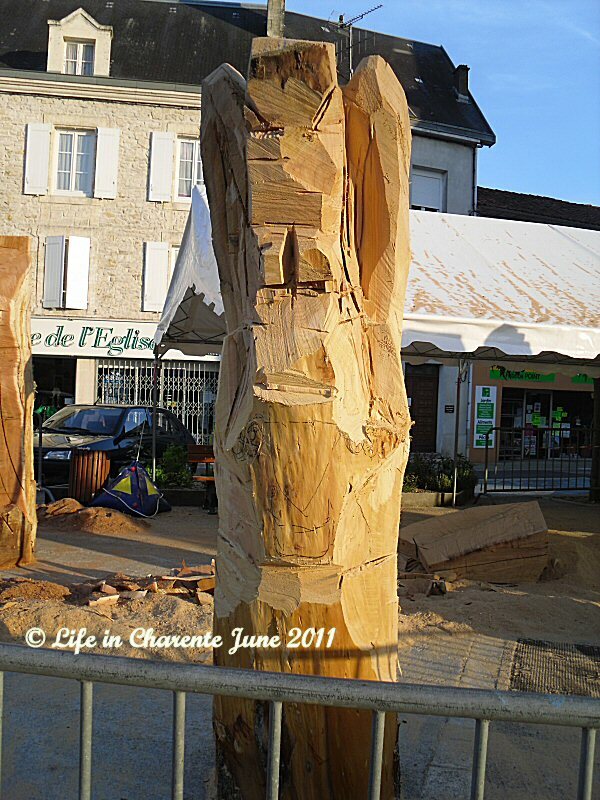 The fourth log was modern art, and at this stage I had still not decided if it was my style or not! This face was very distinctive already. This one I thought may be an angel but you will soon see how wrong I was! I was still not sure about the modern art, but thought it was time you took a look! 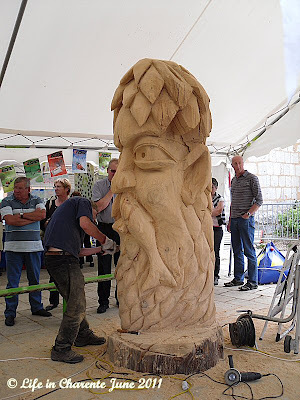 I have also realised that somehow I missed photos of the fifth log until the end! The face was improving by the minute. My last visit and they were still working on the finishing touches. Note the moustache is in fact a fish. There were two of them, one on each side. and from the back, suddenly a turtle appeared. 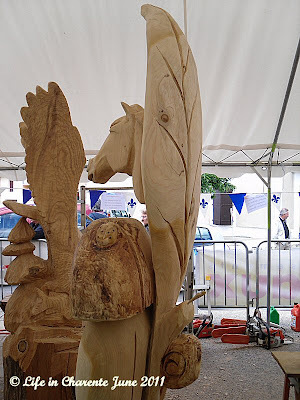 The carving I had previously missed, has a horses head above a mushroom, with a snail climbing up the right hand side. On the top of the mushroom is a ladybird. and a final summation of the week's work. It's nice to see such craftsmanship in action, and I admire their use of the chain saws! It is a machine I would fear to use - mind you, Diane, I doubt I would even be able to pick one up let alone use it! They are quite remarkable aren't they? I'm always impressed with people who have such raw talent. You should have had a word with the Diane and commissioned them to make a totem pole for your lovely garden there. Now THAT would get the neighbours talking! What beautiful work, and so very difficult to achieve. 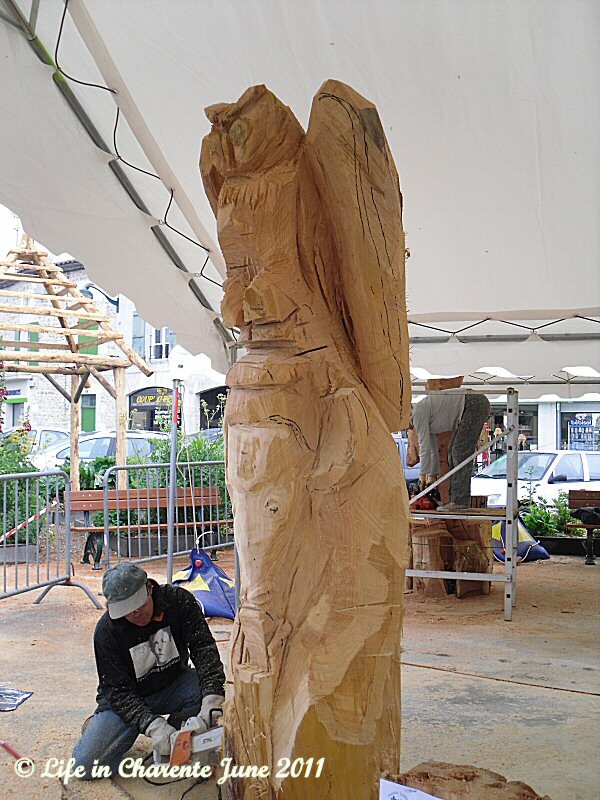 It looks easy to those who have not tried carving. But, it is not. Great artisans, indeed. I love watching a work in progress and see how it develops. So good of you to show us. Each year on Siesta Beach they have sand sculptors and it is the same amazement of what they can do with sand, very fascinating. How did they do that so quickly??? 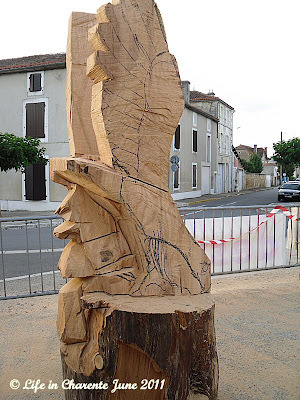 Amazing work on such large pieces of wood. I love the giant birds. I love wood carvings. Recently on a visit to my mom we passed through the town of Hope. They had many wood carvings scattered around the town but I didn't take any photos! Wow amazing - yes one of those would be a talking point in your garden - but as you say if you have to ask the price perhaps it is out of the question! 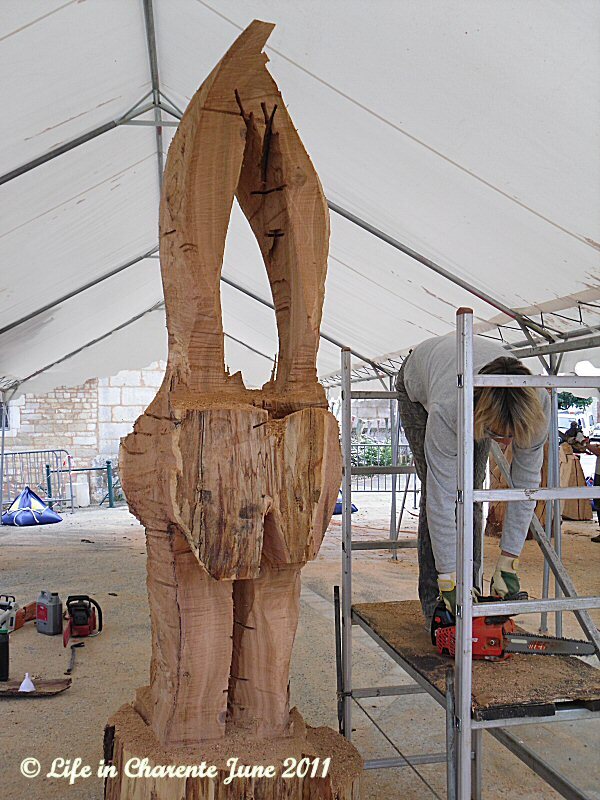 Amazing wood sculptures - such detailing - I imagine the smell of the beautiful cedar would have added to the atmosphere of the occasion! Their jobs look amazing, respect their beautiful jobs. How very cool to follow this process. And such major changes. I am amazed that people can carve with a chainsaw. Wow,what incredible talent! I cannot imagine myself working away with a chainsaw like that! These guys are brilliant Diane, I can just about manage to cut a large branch off with my chain saw. Well you have completely gob-smacked me here Diane. I dropped in to read about France, a country I adore like yourself. Instead I can smell the cedar of where I grew up in western Canada, where these sorts of carvings are everywhere. The west coast of British Columbia is where the famous totem poles are still carved today by the people of the First Nations. 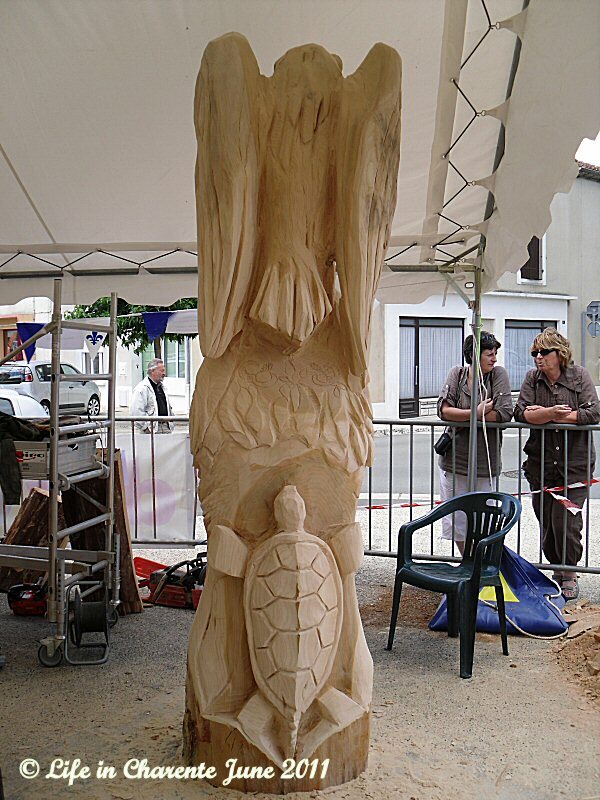 I am so pleased that you like the carvings so much, and I like the idea of a bear :) in your lovely garden! Wow, that's amazing art work, very fascinating! wow, some of them are very elaborated! Wow! It is really amazing what some people can do with a piece of wood! Diane, you're so lucky to have witnessed the whole progress of the making. The artworks are absolutely stunning. Yes Lyndsey is also very lucky. The yearly sand scruptors show normally located at her nearby beaches. :o) Thank you for sharing the pictures. They're amazing. Have a great week ahead, dear. 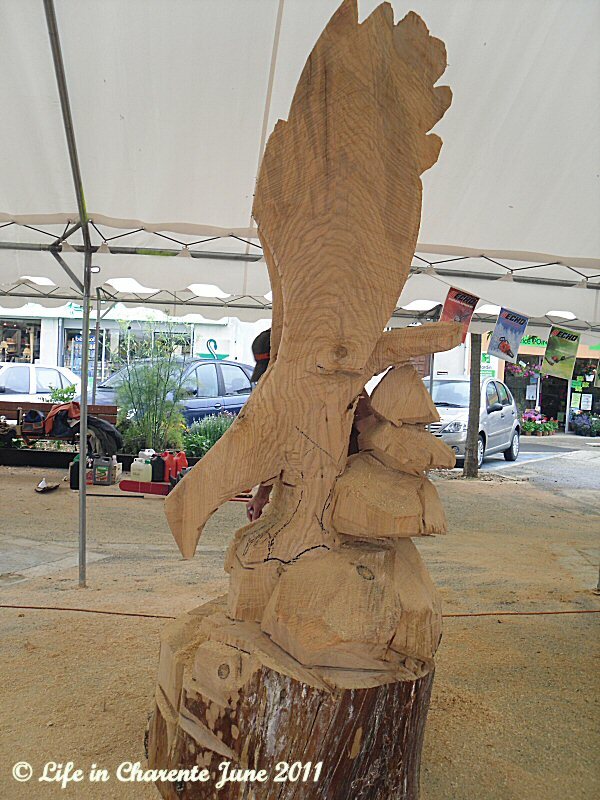 Isn't it amazing what these people can do with a chain saw? Sometimes, they have contest with blocks of ice here..I am always in awe..I can't even make a radish rose with a knife..always lose a piece of the radish..haha.. These carvings are amazing, thanks for sharing with us Diane. Amazing post Diane! What a show this is! It must be an exciting thing to watch artists carving with lots of creative imagination and get to see the finished work of art. This reminds me of the beautiful ice sculptures also done in Canada. Thanks for sharing this! 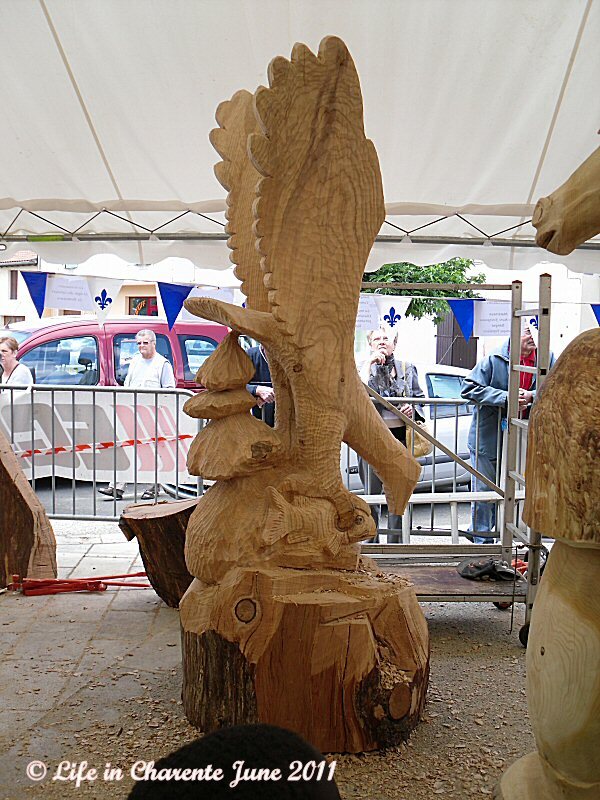 Quel beau reportage.Je remarque que beaucoup de ces sculpteurs s'inspire de la nature.J'aime beaucoup les "moustaches- poissons". Merci de ce très joli compte rendu. Incredible - especially the eagle -i would have loved to have been there! It must be incredibly fascinating to observe this process. Personally, I love to do so. Especially, I like wood carving and pottery. What a great display of talent! 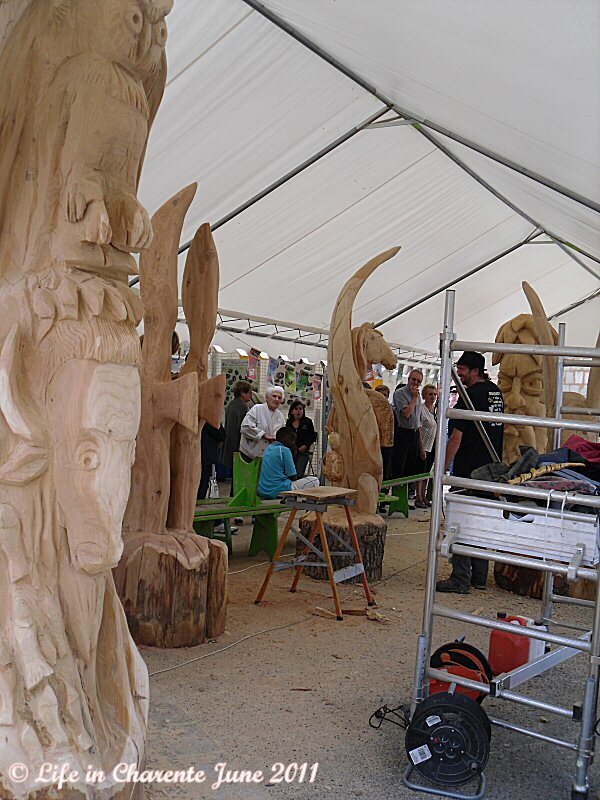 It was fun to see your pictures of the progress on the wood carvings. There was a tree cutter here who used to carve a mushroom from each stump he left with a chain saw. It was very a impressive display. How gorgeous, i would love to see this in action. How lovely that they are back. Their work is amazing, based on the photographs you've snapped. Another great post! :-) Love the pictures. Became wonderfully with your beautiful photos!!!! Christine's Pantry, thanks for the kind comment. Take care Diane. Thanks for showing us these great carvings! What a lovely occupation, the results are stunning! Once you've added "Linkwithin" in your message window, do you have to choose yourself what articles are best in relation to the one you just published or does Linkwithin select them itself? I am still battling within this silly problem! LOL! No hurry, you answer when you have a moment! Cheers and have goo day!! I have seen carvings like these in Alaska. 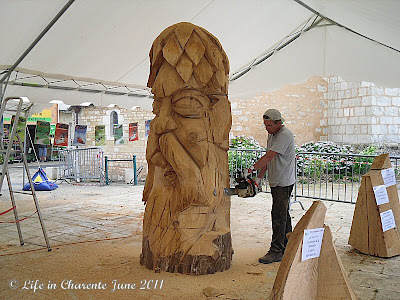 It is nice that these carvers go to France so everyone can enjoy their art. I would like to own one of these carvings but after years in the same house it is so full that I would not know where to place it. I am dumbstruck! This post is awesome and the wood carvings look so beautiful. Lovely blog and great pictures!! Do visit my blog if you love Indian food. Would love to visit here again! What amazing details! I have never seen such intricate carvings! In fact, I've never really heard of this sort of bulk carving. Merci Dianne. Ps. I've been in Hong Kong and my URL changed; perhaps that's why I'm listed as under construction? It is causing me a lot of trobule though! Brittany it is good to have you back. I will have to keep an eye open to follow your blog as the under construction thing does not go away!! 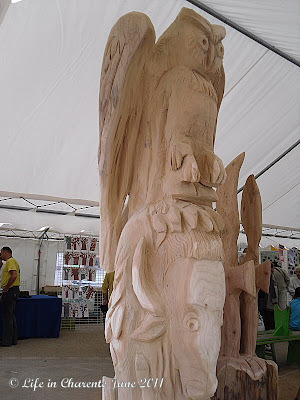 the carvings are really beautiful and i think it;s just fascinating if one is able to come back everyday and just watch the carvers do their work and see the changes in the sculptures. HOw long do these sculptures stay in town, are they going to be moved away to another city? wow, what a creative works. They are very talented. Those wood carvings are beautiful! Amazing how an artist creates these beautiful statues, from head to hands, a beautiful work of art.